We are glad to present a new version of Mail Merge Toolkit, the software that enhances the features of personalized mailing in Microsoft Word, Outlook and Publisher and enables you to perform smart and highly efficient mailouts. As of Version 4.0, the product offers you a new totally redesigned user interface. 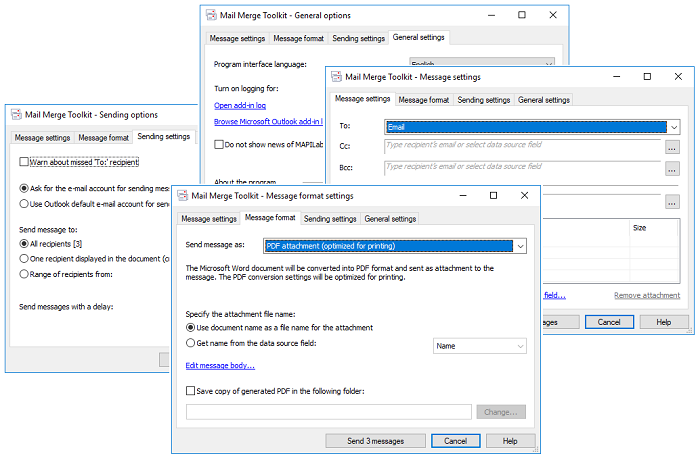 Now when you finalize merging and call Mail Merge Toolkit to use its advanced mail merge features, you can adjust all the settings in 4 different dialogue windows: setup personalized To, CC, and BCC values, define the source of personalized attachments for each recipient, choose the required format of your message, define sending options (accounts, schedule) and so on. This separation makes operations with the app more clear and logical and prevents you from forgetting or skipping any important things before sending. you can delay the start of your mailing according your requirements. As usual, the full list of features and changes of the new version is available on the product homepage ('Version history' tab). We also would like to note that all the improvements described above works in both Standard and PRO editions of Mail Merge Toolkit. You are welcome to update the product on the Mail Merge Toolkit homepage.